A lovely and tranquil celebration of nature The sun has set, the day has ended, but the night hasn't quite arrived yet. This magical twilight is known as the blue hour. Everything in nature sky, water, flowers, birds, foxes comes together in a symphony of blue to celebrate the merging of night and day. With its soothing text and radiant artwork, this elegant picture book displays the majesty of nature and reminds readers that beauty is fleeting but also worth savoring." This is a very blue book, as the sunsets the world turns blue. There are wonderful illustrations here, bright, realistic and sure to keep the attention of readers. With a wonderful array of unique animals and plants showing this wonderful planet. The map at the end finished this book off nicely depicting each critter and where they live. 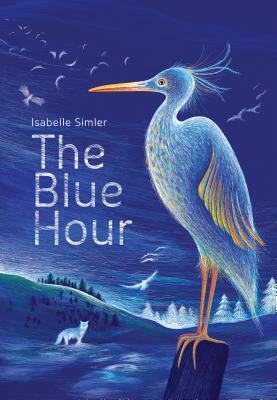 The Blue House is a perfect bedtime story while at the same time great for older children introducing them to different, colorful and animals they might not be familiar with. Thanks to the publisher via Netgalley for an advanced copy.